The Lunar Reconnaissance Orbiter is revealing previously undetected landforms that indicate the moon is shrinking. 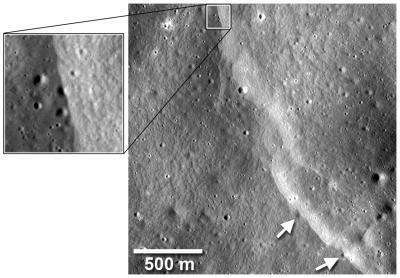 The findings are reported in a paper, "Evidence of Recent Thrust Faulting on the Moon Revealed by the Lunar Reconnaissance Orbiter Camera" scheduled for publication in the Aug. 20 issue of the journal Science. Newly discovered cliffs in the lunar crust indicate the moon shrank globally in the geologically recent past and might still be shrinking today, according to a team analyzing new images from NASA's Lunar Reconnaissance Orbiter (LRO) spacecraft. The results provide important clues to the moon's recent geologic and tectonic evolution. The moon formed in a chaotic environment of intense bombardment by asteroids and meteors. These collisions, along with the decay of radioactive elements, made the moon hot. The moon cooled off as it aged, and scientists have long thought the moon shrank over time as it cooled, especially in its early history. The new research reveals relatively recent tectonic activity connected to the long-lived cooling and associated contraction of the lunar interior. "We estimate these cliffs, called lobate scarps, formed less than a billion years ago, and they could be as young as a hundred million years," said Dr. Thomas Watters of the Center for Earth and Planetary Studies at the Smithsonian's National Air and Space Museum, Washington. While ancient in human terms, it is less than 25 percent of the moon's current age of more than four billion years. "Based on the size of the scarps, we estimate the distance between the moon's center and its surface shrank by about 300 feet," said Watters, lead author of a paper on this research appearing in Science August 20. "These exciting results highlight the importance of global observations for understanding global processes," said Dr. John Keller, Deputy Project Scientist for LRO at NASA's Goddard Space Flight Center, Greenbelt, Md. "As the LRO mission continues in to a new phase, with emphasis on science measurements, our ability to create inventories of lunar geologic features will be a powerful tool for understanding the history of the moon and the solar system." The scarps are relatively small; the largest is about 300 feet high and extends for several miles or so, but typical lengths are shorter and heights are more in the tens of yards (meters) range. The team believes they are among the freshest features on the moon, in part because they cut across small craters. Since the moon is constantly bombarded by meteors, features like small craters (those less than about 1,200 feet across) are likely to be young because they are quickly destroyed by other impacts and don't last long. So, if a small crater has been disrupted by a scarp, the scarp formed after the crater and is even younger. Even more compelling evidence is that large craters, which are likely to be old, don't appear on top any of the scarps, and the scarps look crisp and relatively undegraded. Lobate scarps on the moon were discovered during the Apollo missions with analysis of pictures from the high-resolution Panoramic Camera installed on Apollo 15, 16, and 17. However, these missions orbited over regions near the lunar equator, and were only able to photograph some 20 percent of the lunar surface, so researchers couldn't be sure the scarps were not just the result of local activity around the equator. The team found 14 previously undetected scarps in the LRO images, seven of which are at high latitudes (more than 60 degrees). This confirms that the scarps are a global phenomenon, making a shrinking moon the most likely explanation for their wide distribution, according to the team. 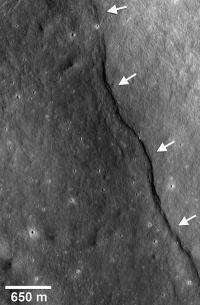 As the moon contracted, the mantle and surface crust were forced to respond, forming thrust faults where a section of the crust cracks and juts out over another. Many of the resulting cliffs, or scarps, have a semi-circular or lobe-shaped appearance, giving rise to the term "lobate scarps". Scientists aren't sure why they look this way; perhaps it's the way the lunar soil (regolith) expresses thrust faults, according to Watters. Lobate scarps are found on other worlds in our solar system, including Mercury, where they are much larger. 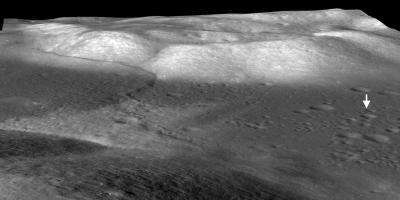 "Lobate scarps on Mercury can be over a mile high and run for hundreds of miles," said Watters. Massive scarps like these lead scientists to believe that Mercury was completely molten as it formed. If so, Mercury would be expected to shrink more as it cooled, and thus form larger scarps, than a world that may have been only partially molten with a relatively small core. Our moon has more than a third of the volume of Mercury, but since the moon's scarps are typically much smaller, the team believes the moon shrank less. Because the scarps are so young, the moon could have been cooling and shrinking very recently, according to the team. Seismometers emplaced by the Apollo missions have recorded moonquakes. While most can be attributed to things like meteorite strikes, the Earth's gravitational tides, and day/night temperature changes, it's remotely possible that some moonquakes might be associated with ongoing scarp formation, according to Watters. The team plans to compare photographs of scarps by the Apollo Panoramic Cameras to new images from LRO to see if any have changed over the decades, possibly indicating recent activity. While Earth's tides are most likely not strong enough to create the scarps, they could contribute to their appearance, perhaps influencing their orientation, according to Watters. During the next few years, the team hopes to use LRO's high-resolution Narrow Angle Cameras (NACs) to build up a global, highly detailed map of the moon. This could identify additional scarps and allow the team to see if some have a preferred orientation or other features that might be associated with Earth's gravitational pull. "The ultrahigh resolution images from the NACs are changing our view of the moon," said Dr. Mark Robinson of the School of Earth and Space Exploration at Arizona State University, Tempe, Ariz., a coauthor and Principal Investigator of the Lunar Reconnaissance Orbiter Camera. "We've not only detected many previously unknown lunar scarps; we're also seeing much greater detail on the scarps identified in the Apollo photographs." We didn't dig up the obelisk in time. 1. If the moon is supposed to be shrinking, how long has the shrinking been going on for? 100 million years? Not likely. It should now be dead and quiet. 2. If those scarps are 100million years old why are there no crater indents OVER them? Is there any evidence that the scarps have been hit by asteroids/meteorites in the supposed 100Ma? If not, then one has to come to the conclusion that either there were no hits in 100Ma - which would be preposterous or else those scarps are a lot younger than thought and hence the moon is still much more active than it should be according to current evolutionary theory. In fact one could point out that such theory is seriously at fault and needs to be revised: the moon is showing signs of life - after 4.5Ga - which is extremely unlikely. Couple this with the isolated reports of volcanic and seismic activity and things really get hot for the molten rock theory. If the moon is supposed to be shrinking, how long has the shrinking been going on for? 100 million years? Not likely. It should now be dead and quiet. It is dead and quiet. 2. If those scarps are 100million years old why are there no crater indents OVER them? Did you not look at the attached picture?